Too broke or broken, too old or young, too stressed or busy to make your dreams reality? 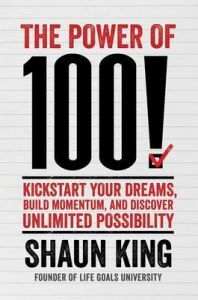 Join Shaun King and walk the transformative path to overcoming adversity and achieving success as he reveals practical steps to a life of unlimited possibility. Have you lost a job that you loved, or never even gotten the chance to start? Are you in a rut of mediocre, status-quo living, too tired and stressed to find a way out? Do you wonder whatever happened to the dreams you once dared to dream? Shaun King has been there, and he wants you to know that it's not too late. Shaun knows firsthand what it's like to see your dreams fade away right before your eyes; he's lived through brutal spinal surgeries, had to survive on food stamps, worked four jobs at once, and he nearly died in a car accident that required over 400 stitches on his face alone. But he's also emerged stronger and overcome the odds to become a successful businessman, social media pioneer, and humanitarian. Now he wants you to know that you can still take the dreams God has placed in your heart, craft them into goals, and actually make those goals into your reality. In an entertaining and conversational style, Shaun King shares the trials, research, and years of practice that have helped him form practical principles and effective strategies for overcoming adversity and achieving success. He encourages you to grasp the truth that your life has more potential than you understand; you just need to face your weakest points and unlock that potential.